1).The vibration exciter bearing is lubricated with lithium grease. It has been refilled at the factory. It will be refilled every 48 hours and observed every shift. Pay attention to the temperature rise. 2). When the bearing position temperature is too high or there is oil overflow, the oil has been added excessively. The oil should be taken out to prevent the bearing from being burned out. 1). Check the tightening degree of all bolts before driving, and re-tighten once after 8 hours of initial work. 2). Check the tension of the V-belt to avoid slipping during starting or work, and to ensure the alignment of the pulley. 3). Ensure the minimum clearance between all moving parts and fixed objects. 4).The sieve should be started without load. After the sieve is running smoothly, the feeding can be started. Before the shutdown, the feeding should be stopped first, and the material on the sieve surface should be drained before stopping. 5).The feed chute should be as close as possible to the feed end, and as far as possible, the feed should be evenly distributed along the full width of the sieve. 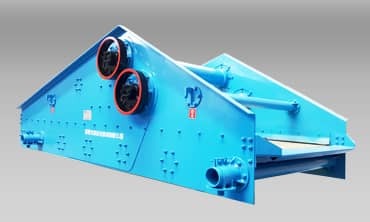 The direction of the feed chute is consistent with the running direction of the material on the sieve surface, so as to obtain the best screening effect. The maximum drop of the feed point to the screen surface is not more than 500mm, ensuring the minimum impact of the material on the screen surface. 6). When the exciter rotates in the direction of the flow, increase the running speed of the material, which can increase the production capacity, but reduce the efficiency of the sieve. When the exciter reverses the flow direction, reduce the running speed of the material, reduce the production capacity, and increase the sieve efficiency.